The Row by Row Experience will be ending in less than a month, this runs through September 2, so you still have time to get in on the fun! What a fun option to add to any of your summer travel plans! So make sure you come in to get your FREE Pattern and we also have our row kitted and available for purchase. Hoppin Bobbin has their WINNER! 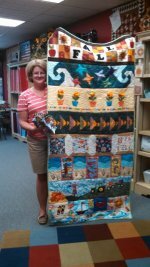 Sandra Anderson, from Havre de Grace, came in on Friday July 25th with her finished Row by Row Experience Quilt. 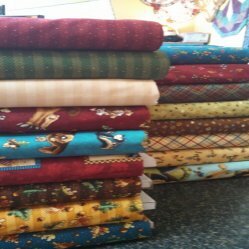 Sandra is a frequent shopper at Hoppin Bobbin and she received her 25 fat quarter bundle and a $25.00 gift card for using our row. Her quilt is hanging in the shop for you to see! We have had so much fun with this and have met some fabulous ladies, and gentlemen, from as far as California and Germany. Nothing says winter more than a Snow Day. Snowflakes and snowmen in a frost covered town, with snow covered trees and a train for you. The coordinating prints, accent the snowman panel, hometown train station panel, tree skirt, and an apron in this 13 bolt collection. 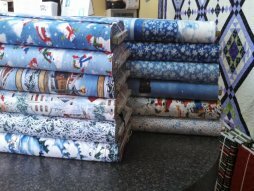 These 12 bolts of fabric will surely get you into the Christmas mood. Reds, greens, creams, and blacks featuring ornaments, snow flakes, and the one and only Jolly Santa. A fabulous border print, advent calendar and a Jolly Santa panel. Lions, tigers, and bears oh my.....Oops.. wrong animals, how about Bears, Raccoons, Skunks and a friendly Moose. With theses 18 bolts of fabric you can find all your favorite woodland critters. A wonderful panel featuring your friendly moose and all his woodland friends. Pre-printed quilt blocks with coordinating prints with plaids, florals, characters, animal tracks, and acorns with leaves. Starting the end of August, Hoppin Bobbin will be offering a FREE block of the week on Facebook ONLY. This is a series of 40 blocks that will introduce several remarkable Women of the Bible. Each pattern will only be available, online, for 2 weeks. This will go on for about 41 weeks. Make sure you LIKE us on Facebook and share with friends and family. Make sure you keep an eye out for further updates on this series. Saturday, September 6th from 9:00 a.m. to 3:00 p.m.
Saturday, September 13th from 9:00 a.m. to 3:00 p.m.
As you all know its August and Christmas is just around the corner. We would like to remind everyone that our cut-off date for Long-arm quilting services is November 1st, to guarantee return before Christmas. 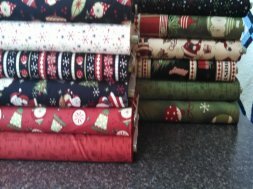 Any quilts received after November 1st will incur a $50.00 rush fee to guarantee completion before Christmas. There will be no exceptions. Please plan ahead and prepare early.